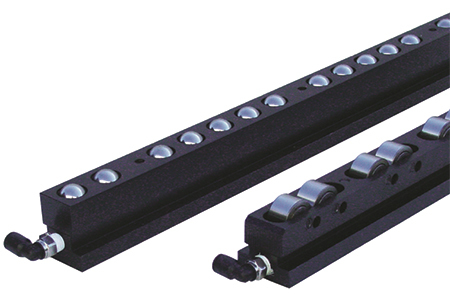 Pacesetter Systems, Inc., Valencia, CA, introduces its Air Glide heavy-duty pneumatic die lifters, available with ball bearings for multidirectional movement or cylindrical bearings for inline movement. Both models feature extra-large, precision-ground bearings and high quality o-ring seals to optimize lifting efficiency and durability, ensuring quick and safe die changes. Only 40 lb. of force is required to move a typical 2000-lb. die. Air Glide die lifters are available from stock in 5⁄8-, ¾- and 1-in. sizes in lengths to 72 in. ; custom lengths and metric sizes are available.